Fleet Jazz is delighted to welcome the hard-swinging warm-toned tenor and flute player Jo Fooks, with Steve Waterman, one of the top British jazz trumpet players both at home and on the international scene. Well known and loved by audiences throughout the south, Jo Fooks, whose mellow tone is often compared to Stan Getz and Zoot Simms, won the ‘Young Scottish Musician of the Year’ and went on to study at the Guildhall in London and the prestigious Berklee School of Music in Boston, before being recruited by the late Humphrey Lyttelton into his eight-piece band. 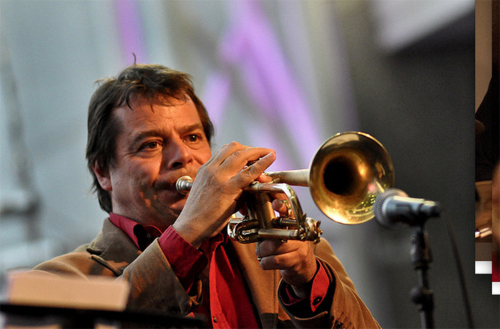 Steve Waterman is one of the top British jazz trumpet players both at home and on the international scene. He began his career while studying at Trinity College Of Music, and since then has worked regularly on the British and European jazz scene. Steve is a prolific composer, and has recorded several critically acclaimed CDs under his own name. Ted Beament is one of the UKs most respected pianists, having played with the Humphrey Lyttleton Band for many years and, before that, with George Melly. In addition, Ted has played with just about every major name on the UK jazz scene – as well as many visiting American jazz stars. Buster Birch studied drums and percussion at the University of London and later at the Guildhall School of Music. He moved to New York where he gigged and continued his studies at the drummers collective in Manhattan and privately with Jo Morello (from Dave Brubeck’s famous quartet). He has since performed in over 30 countries with various orchestras, Jazz groups and other world music ensembles. Winner of the Jazz Piano Category of The British Jazz Awards, Craig Milverton is firmly established as one of Britain’s top jazz pianists. “A master of whatever he chooses to perform”, Humphrey Lyttleton, “An extravagantly gifted pianist with an unrivalled sense of swing” Dave Gelly. In his latest project, ‘A Tribute To Oscar Peterson’ Craig pays homage to probably the greatest of all Jazz Pianists, and his biggest influence, Oscar Peterson. This show highlights all the great recordings of Oscar from his biggest hit ‘Tenderly’, to his best-selling Album ‘Night Train’. Australian saxophonist, Ronnie Scott’s Late Show regular and “arguably the most exciting tenor player in Britain today “ (JAZZWISE), Brandon Allen salutes the groovy soul-jazz of legendary Chicagoan saxophonist Gene Ammons, in a show which seeks to capture the spirit of Ammons and his music over his entire career, from 1943 to 1974. Janette Mason presents the Music of Ella Fitzgerald and Sarah Vaughan featuring Juliet Roberts and Vimala Rowe. Drawing on the classic albums of these iconic jazz vocalists, Janette Mason has put together a swinging set of music featuring two of the finest singers around. Vimala Rowe has established herself on the Jazz Scene as a remarkable live performer, appearing with such luminaries as John Etheridge, Bobby Wellins, Jonathan Gee and more. Juliet Roberts is a British jazz and house music singer. Celebrating a career that has spanned thirty years, she has recorded and performed with Ray Charles, Miles Davis, Stevie Wonder, Chaka Khan and Courtney Pine to name a few. Janette Mason is an composer, pianist and artist in her own right and has performed with everyone from Brit Pop band Oasis, to jazz Legends Ian Shaw and Claire Martin. An outstanding concert to end the season! Born in 1975 in Milano, Italy Tommaso started playing the saxophone and studying music at the age of 18. He moved to the United Kingdom in 1994 where he graduated at Birmingham Conservatoire with a Bmus first class honours and later at the Guildhall School Of Music and Drama with a Postgraduate Degree in jazz studies in the year 2000. He has performed with some of the most respected jazz musicians including Billy Cobham, David Liebman, Kenny Wheeler, Stan Sulzmann, Jim Mullen, Jonathan Gee, Paolo Pellegatti, Gianni Giudici. In 2008 Tommaso was awarded with an Honorary Membership by Birmingham Conservatoire given to him for his significant contributions made across the years within the various branches of the music profession. ‘Celebrating the Music of Michel Petrucciani’, a new CD recorded by Tommaso Starace’s Italian Quartet, is a project dedicated entirely to the music of the great French pianist. Petrucciani was very much respected by the American Jazz Community and around the world for his extraordinary technique, elegance of execution, and his charismatic energy conveyed through his many memorable performances and compositions. Petrucciani led his band over many years recording a total of 32 albums and the quintet will perform some of the most popular tunes from his extensive repertoire, as well as some other well loved jazz standards. Featuring Tommaso Starace on alto sax, with the UK’s vibraphone virtuoso Roger Beaujolais, pianist Frank Harrison, Chris Nickolls on drums, and Marianne guesting on bass. A career-wide celebration of the great lyrical genius of the saxophone Stan Getz, from ‘Early Autumn’ (1949) to ‘People Time’ (1991), taking in the swinging 1950s, the bossa nova years of the early 1960s and the fruitful, daring collaborations with Chick Corea and Kenny Barron. Featuring woodwind star of the John Wilson Orchestra star MARK CROOKS (saxophone) with CHRIS INGHAM (piano/commentary), MARIANNE WINDHAM (bass) and GEORGE DOUBLE (drums). From the late 1940s to the early 1990s, tenor saxophonist Stan Getz was one of the great, individual instrumental artists in jazz. As jazz itself went through many phases, Getz as a player was remarkably consistent, producing album after album of poetic, swinging music. While his accompaniments were elaborately varied, Getz’s playing was always unmistakable, characterised by his singing, luminescent tone, his unmatched facility for elegance, passion and lyricism and an almost supernatural melodic creativity. However, for a man who could have toured lucrative Greatest Hits shows for most of his career, his choices in both in the material that he tackled and the musicians with whom he associated, show a notably intrepid attitude. Stan thrived on challenge and was dedicated to keeping his music fresh and vital, rarely taking the easy option. The result is a musical legacy among the richest in jazz. Early in 2005, tenor saxophonist and British Jazz icon TIM WHITEHEAD toured with the award-winning Italian pianist GIOVANNI MIRABASSI, which led to the release of their album Lucky Boys in 2006 and since then they have continued to work together both in the UK and Europe. After a recent gig in Paris to celebrate the 20th year of Giovanni’s career, they are back together for a UK tour this Autumn, and we are delighted to welcome them to Fleet Jazz for what is sure to be a very special night! A self-taught Paris-based Italian pianist whose technique is grounded in the example of his compatriot Enrico Pieranunzi and the modern masters Bill Evans and Keith Jarrett. He has enjoyed considerable international success and is hugely popular in Japan and South Korea. In 2001 he recorded his first solo album ‘Avanti!’, which won him the prestigious Victoires du Jazz in 2002. His album “air”, a trio with Glenn Ferris and Flavio Boltro was voted best album of the year 2003 by the Django Reinhardt Academy of Jazz. In 2006, Giovanni and Tim recorded ‘Lucky Boys’ with co-leader status and sharing the compositional duties, with Oli Hayhurst on bass and Milo Fell on drums. Renowned throughout the UK, Europe and the USA, the multi-award-winning Tim Whitehead is a remarkable performer and composer with a dazzling CV. From work in the 70’s with Ian Carr’s “Nucleus” and “Graham Collier Music” (winning the Young Jazz Musician of the Year Award on the way), and in the 80’s with groundbreaking big band Loose Tubes and the likes of John Parricelli, Django Bates, Nic France and Pete Jacobsen, to the critically acclaimed albums he made in the 90’s, winning The Andrew Milne Award for Jazz, as well as the BBC Music Magazine Jazz Album of the Year, Tim has established himself as an international musician of considerable note. Tim was also the first ever musician to be made Artist in Residence at Tate Britain, resulting in a number of brilliant gigs, a highly acclaimed album “Colour Beginnings” and a short-listing for the British Composer Of The Year Award in 2010.